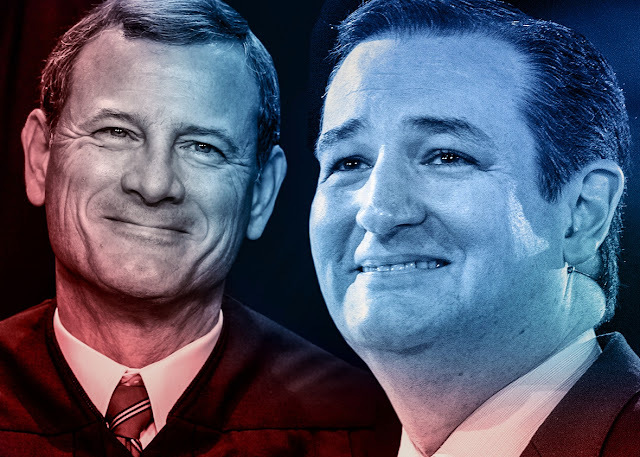 UnderCover Politics: Ted Cruz op-ed from 2005: John Roberts should be a quick confirm. Ted Cruz op-ed from 2005: John Roberts should be a quick confirm. In 1995, while clerking for Chief Justice William Rehnquist, I and my two fellow law clerks asked the chief whom he thought was the best Supreme Court lawyer currently practicing. The chief replied, with a twinkle in his eye, that he thought he could probably get a majority of his colleagues to agree that John Roberts was the best Supreme Court advocate in the nation. This week, the president announced his intention to nominate John Roberts to be a Supreme Court justice. His nomination has been met with widespread praise, from left and right. Nevertheless, there are some who have raised complaints that his two years on the bench provide insufficient record for them to assess (and attack) his jurisprudence. That complaint misses the mark for three reasons. First, his judicial record would have stretched 14 years, had Senate Democrats not delayed its consideration twice, in 1991 and again in 2001. When his nomination did finally make it to the Senate floor, in 2003, he was confirmed by unanimous consent.